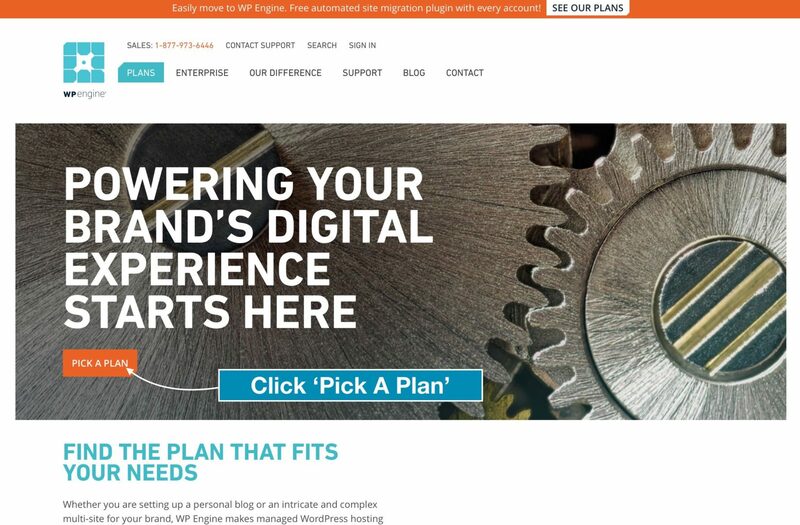 The post WP Engine Coupon Code April 2019: Don’t Be Fooled By “50% Off” Promo Codes! appeared first on Payette Forward. WP Engine offers coupon codes on best-in-class WordPress hosting. Our WP Engine coupon code will help you to save hundreds of dollars per year. In April 2019, top-notch hosting can be affordable for everyone. WP Engine offers world-class reliability, speed, and security. They also offer some of the best coupon codes around, but don’t be fooled by the “50% off” offers you see on other websites — it’s 50% off for the first three months, and then up to $35 / month, forever! We’ll help you save $53.50 more. What Is The Best WPEngine Coupon Code In April 2019? Our WP Engine coupon code saves you $52.50 more than the “50% off” promo codes on other websites. Important: Make sure you choose an annual plan and not just a monthly plan! You’ll save hundreds in the long run and you can cancel risk-free within the first 60 days. Click the button below to activate and redeem our WPEngine coupon code wpe3free. This code works in April 2019! Important: Double-check you’ve entered and applied wpe3free at checkout to get the best deal! Tip: You can cancel risk-free for 60 days. Coupon code automatically fills in at checkout. Our code: $315 for the first year & $350 / year thereafter (includes two months free every year). Their “50% off” code: $17.50 for first 3 months + $35 for the following 9 months = $367.50 first year & $420 / year ($35 / monthly) thereafter. It’s a no brainer! We’ve discovered the best WP Engine coupon code in April 2019, so you can stop wasting your time on other websites with coupon codes that don’t save you very much money or don’t work at all. Our coupon code is better than the “50% off the first 3 months” coupon code you’ll see on other websites. Here’s the math: You’ll save an additional $53.50 in the first year alone by using our coupon code. How Do I Redeem A WP Engine Coupon Code? Visit the WP Engine website using this link to activate your coupon code (it will automatically appear at checkout). Your coupon code will automatically appear on the checkout page. Whether you’re looking for a WP Engine coupon code for yourself or a small business owner, your time is valuable. 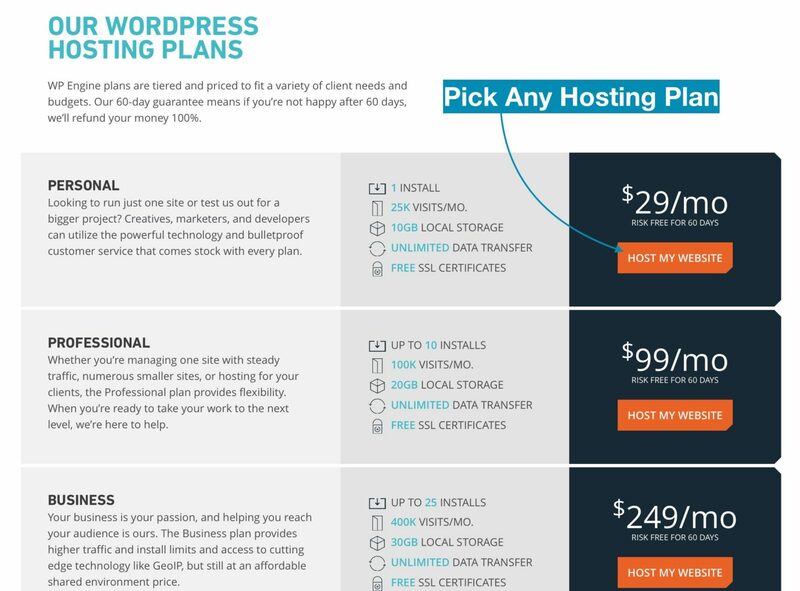 WP Engine charges a few dollars more per month than some of the cheaper hosting providers, but what you get in return could easily save you hundreds or thousands of dollars a year. For example, web developers often charge $100 an hour for their services, and if anything goes wrong with your website, you could be on the hook for a lot of money. With WP Engine, their trained WordPress experts are available 24 hours a day to troubleshoot and solve any problems that may arise. Everyone’s heard of hackers, and most people don’t know how to protect themselves against them. A hacked website could mean hundreds or thousands of dollars in lost revenue, but WP Engine’s world-class security experts constantly monitor and scan for intruders of any kind. They block over 2 million attacks every day for their customers. WP Engine isn’t just used by individuals, either. National Geographic, AMD, SoundCloud, Reader’s Digest, and other major companies all host their websites on WP Engine. There’s a reason they trust WP Engine with their data: WP Engine is the best. WP Engine: The Most Affordable Long Term Solution? 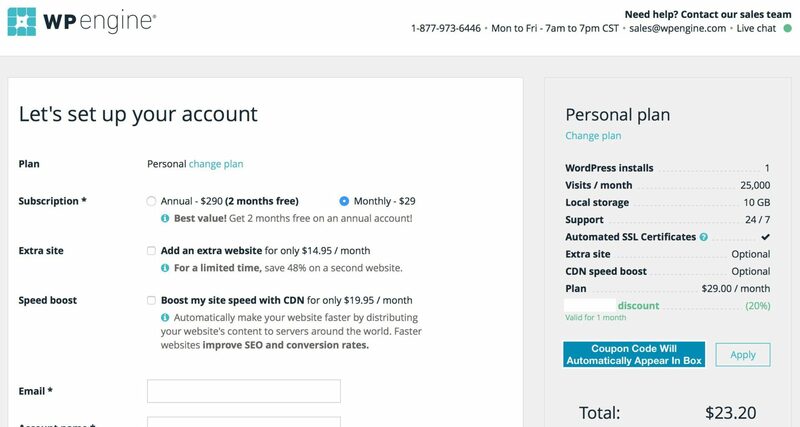 When you’re shopping for WordPress hosting, don’t use the hosting provider’s monthly fee as your sole basis for making a decision. You need to look at the overall cost of running a website, and if you’re not a Internet guru yourself, you’re probably going to need help somewhere down the line. Based on my experience, it may be sooner than you think! WP Engine is your best bet for setting yourself up for success in 2018 and letting you focus on your business instead of trying to put out fires with a low-cost web hosting provider. Make sure to use our WP Engine coupon code (appears automatically at checkout) to get the best deal on WP Engine hosting in April 2019. Other websites have coupon codes too, but we wanted to write this article to save you frustration because a lot of their codes are outdated or expired. Thanks for reading, and we know you’ll enjoy using WP Engine. Note: We may receive a referral fee from WP Engine if you make a purchase after clicking a link on this page. The post iPhone Water Damage: Ultimate Guide On How To Fix Liquid Damage appeared first on Payette Forward. Taking the right first steps can be the difference between life and death for an iPhone with liquid damage. Unfortunately, there’s a lot of misinformation online about what really works when it comes to rescuing a liquid-damaged iPhone. In this article, we’ll explain what causes iPhone water damage and show you how to check for it. 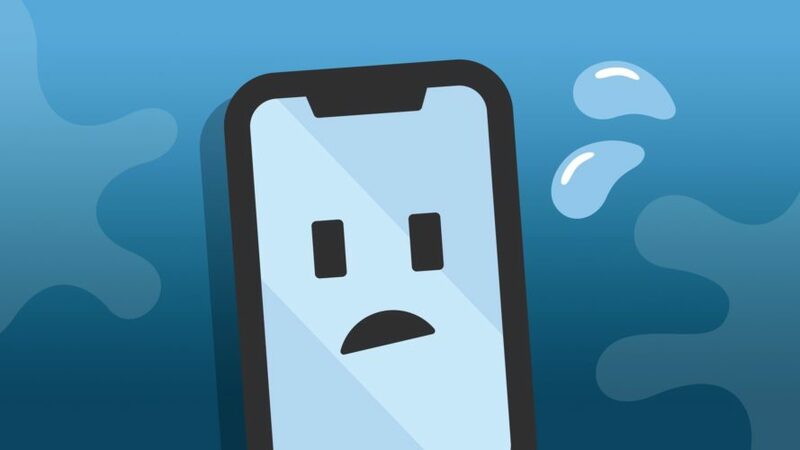 We’ll talk about common symptoms of water damage, what to do immediately after dropping an iPhone in water, and how to decide whether to fix a water-damaged iPhone or buy a new one. What Does iPhone Water Damage Look Like? How Does iPhone Water Damage Occur? Emergency! I Just Dropped My iPhone In Water. What Should I Do? Can iPhone Water Damage Be Fixed? Should I Repair My iPhone Or Buy A New One? Can I Sell A Water Damaged iPhone? 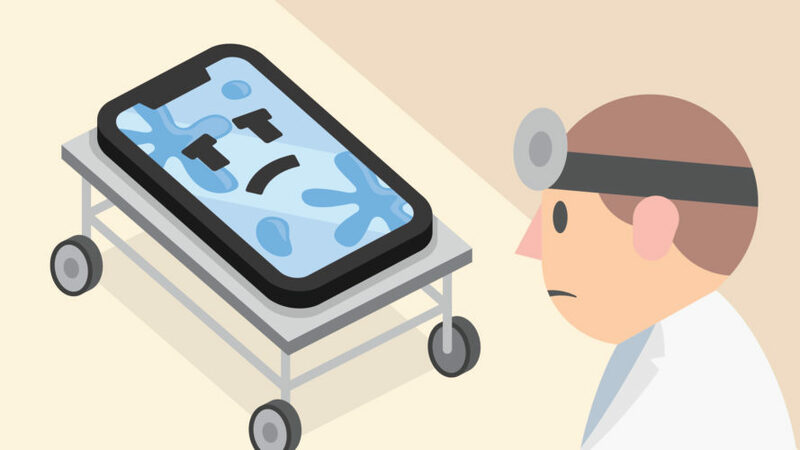 If you just dropped your iPhone in water and you need immediate help, skip down to the Emergency section to learn what to do when an iPhone is exposed to liquid. During my time at the Genius Bar, I learned that liquid damage doesn’t only occur when iPhones get dropped in toilets and pools. It happens at the gym, playing golf, or on a hike. iPhone water damage can happen anywhere. A single drop can wreak havoc inside an iPhone. Every iPhone since the 7 has been advertised as water-resistant, but this shouldn’t be confused with being waterproof. We’ll get more into IP ratings and the difference between waterproof and water-resistant later in this article. In short (there will be puns), liquid damage occurs when water or another liquid comes into contact with an iPhone’s water-sensitive electronics. Although newer iPhones are less susceptible to water damage than older models, a tiny drop of liquid is all it takes to damage an iPhone beyond repair. The water-resistant seal on newer iPhones is just as susceptible to wear and tear as the rest of the phone. It’s designed to resist water, but not the wide array of liquids, lotions, and gels that many of us use every day. Liquid damage can be obvious or invisible. Sometimes it appears as tiny bubbles under the screen or corrosion and discoloration inside its charging port. However, iPhone water damage usually doesn’t look like anything — at least from the outside. The best way to check for iPhone water damage is to look at its liquid contact indicator, or LCI. On newer iPhones, the LCI is located in the same slot as the SIM card. 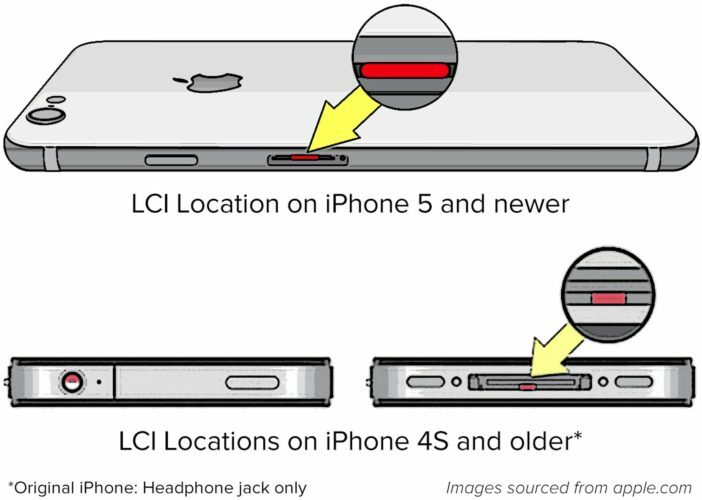 On older models of the iPhone (4s and earlier), you’ll find LCIs in the headphone jack, charging port, or both. To check the LCI on a newer iPhone, use a paperclip to pop out the SIM tray, which is located below the side button (the power button) on the right side of your iPhone. Stick the paper clip inside the tiny hole. You may need to press down with some force to eject the SIM tray. Note: It’s important to make sure the outside of your iPhone is completely dry before you remove the SIM tray. If you just dropped your iPhone in liquid and it’s still wet, skip down to our section on what to do first if your iPhone gets dropped in water. Next, remove the SIM tray and SIM card, and hold your iPhone with the screen facing down. From this angle, use a flashlight to look into the SIM card slot and check the LCI. As we’ll discuss later, it’s better to leave a wet iPhone face down on a flat surface than face up. It’s easier to see the LCIs on older iPhones. Shine a flashlight into your iPhone’s headphone jack or charging port, depending on which model you have. What Does An LCI Look Like? The size and shape of an iPhone’s LCI varies from model to model, but it’s usually pretty to tell if the LCI has been “tripped”, as we used to say at the Genius Bar. Look for a small line or dot just inside the edge of the SIM card slot, at the bottom of the headphone jack, or in the middle of the dock connector (charging port) on older iPhones. What Happens If My LCI Is Red? A red LCI indicates that your iPhone has come into contact with liquid, and unfortunately, that means you’ll have to pay. You’ll pay less if you have AppleCare+ or carrier insurance than if you have no coverage at all. We’ll get into prices and how to decide whether to repair or replace a water damaged iPhone below. But don’t lose hope. Just because an LCI is read doesn’t mean an iPhone won’t come back to life. What Should I Do If The LCI Is Pink? Unfortunately, pink is just a lighter shade of red. Whether the LCI is light red or dark red, your iPhone has some sort of liquid damage and won’t be covered under warranty. What Should I Do If The LCI Is Yellow? Although it doesn’t happen very often, don’t be surprised if your LCI appears yellow. The good news is that yellow isn’t red, which means your iPhone hasn’t been damaged by liquid. Some other substance (gunk, dirt, lint, etc.) may have discolored your iPhone’s LCI. We recommend trying to clean out the SIM card slot, headphone jack, or charging port using an anti-static brush or brand new toothbrush. If the LCI remains yellow, it wouldn’t hurt to take your iPhone into the Apple Store! However, if nothing is wrong with your iPhone, there isn’t much for an Apple tech to do. Will My iPhone Be Covered Under Warranty If Its LCI Is Still White? If the LCI is white or silver, the issue your iPhone is experiencing may not be liquid-related. If you dropped your iPhone in the pool before it stopped working, it probably is. The good news is that if Apple can’t prove your iPhone was liquid damaged, your warranty might still be valid. However, just because a LCI isn’t red doesn’t mean that Apple will cover the iPhone under warranty. If there is any evidence of liquid or corrosion inside an iPhone, Apple techs may deny warranty coverage — even if the LCI is still white. There’s a good chance you’ll cause more damage to your iPhone by tampering with the LCI. Apple techs see LCIs all day, every day. It’s very easy to tell if an LCI is missing. If an LCI has been tampered with, the iPhone goes from out-of-warranty to voided warranty status. A new phone at full retail price costs hundreds of dollars more than an out-of-warranty replacement at the Genius Bar. What’s The Difference Between “Out Of Warranty” and a “Voided Warranty”? If you take a water-damaged iPhone to an Apple Store, you’ll probably be told it’s “out of warranty.” You’ll pay a lot less to replace your iPhone if you have AppleCare+, but even if you don’t, replacing an out of warranty iPhone is a lot cheaper than buying a new one. If your iPhone warranty has been “voided”, that’s bad. An iPhone with a voided warranty has been disowned by Apple. They won’t repair it at the Genius Bar. Your only option will be to buy a new iPhone at full retail price. Generally speaking, the only way to void your iPhone’s warranty is to tamper with it. If you remove the LCI, it voids the warranty. If you take it apart and lose a screw, it voids the warranty. But even if you accidentally smash it, drop it in a lake, or run it over with your car (I’ve seen all of these), you weren’t doing something you weren’t supposed to be doing. (At least, according to Apple.) In those cases, you’ll pay for an “out of warranty” replacement or repair. Water damage can cause a variety of problems on an iPhone. Once liquid gets inside, it’s difficult to know where it will spread or what type of damage it will cause. Below, we’ve listed several of the most common symptoms of iPhone water damage. Water-damaged lithium-ion batteries can get very, very hot. Although it’s incredibly rare (especially for iPhones), lithium ion batteries can catch on fire when they’re damaged. Every Apple Store has a fire safe in the Genius Room. I never had to use it, but be very careful if you feel your iPhone starting to heat up much hotter than normal. When water seeps into an iPhone and causes damage, its speakers could malfunction and disrupt its ability to play sounds. This could affect your ability to listen to music, hear the ringer when someone calls, or make calls of your own using the speakerphone. As water begins to evaporate from inside your iPhone, its speakers may come back to life. If they sound staticy or garbled at first, the sound quality may improve over time — or it may not. We can’t be certain it will help, but the newest Apple Watches use their built-in speakers to expel water after being submerged. Could this work for an iPhone? We’re not sure, but if the speaker is making any sound at all, it can’t hurt to bump up the volume and try. One of the most common and most frustrating iPhone problems happens when it won’t charge. 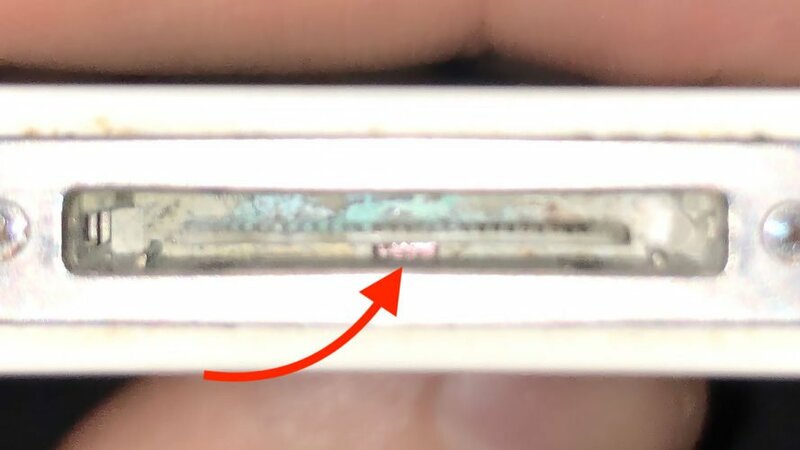 If water gets into your iPhone’s Lightning port (the charging port), it can cause corrosion and prevent your iPhone from being able to charge at all. Try charging your iPhone with multiple cables and multiple chargers before coming to this conclusion. However, if the LCI is red and your iPhone isn’t charging, liquid damage is likely the cause. If you tried to use rice to dry out your iPhone before reading this article (which we don’t recommend), take a flashlight and look inside the charging port. On several occasions, I found a grain of rice stuck inside. Don’t try to jam a Lightning cable inside the lightning port if it’s not going in easily. Instead, use a toothbrush you’ve never used before to gently brush out debris. When it was impossible to remove the rice without damaging the electronics, a phone that may have come back to life had to be replaced. A friend who had this problem actually borrowed tools sculpting tools from a friend to remove the grain of rice, and it worked! We don’t recommend using anything metal, however, except as a last resort. The SIM card is what stores the data on your iPhone that helps you carrier tell it apart from the other phones on its network. Information like the authorization keys of your iPhone are saved on the SIM card. These keys allow your iPhone to access the minutes, messages, and data of your cell phone plan. Your iPhone might not be able to connect to your carrier’s cellular network if liquid has damaged the SIM card or SIM card tray. One sign that your SIM card or SIM tray has been damaged by liquid contact is if it says “No SIM” in the upper left-hand corner of your iPhone’s display. If you can rule out the possibility of a software or carrier-related problem causing your iPhone to say No SIM, you may need to have its SIM card or SIM card tray replaced. When water damage affects an iPhone’s antenna, it will either have no service or very poor service. Either way, an iPhone isn’t an iPhone if you can’t make phone calls. Our article can help you fix issues with poor or no service on iPhone. One sign that your iPhone has significant water damage is if it’s stuck flashing on the Apple logo. When it happens, it’s possible your iPhone is stuck in a restart loop. Simultaneously press and hold the Home button and the power button until the screen goes black and the Apple logo appears. You can release both buttons when you see the Apple logo on the display of your iPhone. Press and hold the volume down button and the power button at the same time until the Apple logos appears on the screen of your iPhone. Release both buttons as soon as the Apple logo appears. Quickly press and release the volume up button, then quickly press and release the volume down button, then press and hold the side button until the Apple logo appears on the display. You may have to hold the buttons on your iPhone for 25–30 seconds, so be patient and don’t give up too soon! When you turn on your iPhone, it asks every component, “Are you there? Are you there?” Your iPhone can get stuck on the Apple logo if just one of those components doesn’t respond. If your iPhone has been stuck on the Apple logo for several minutes, try a hard reset using the method we described in the previous symptom. The iPhone camera might stop working completely if liquid comes in contact with the camera. Even if the camera is working, it’s very common for a water-damaged iPhone to take blurry photos. That happens when the lens becomes obstructed by water or the residue left behind when it evaporates. There’s a chance that if you leave your iPhone alone for a little while, the camera may be completely functional again. If your pictures are still blurry after a few days, you might have to repair your camera. Water damage is often the cause of serious hardware problems that prevent your iPhone from turning on and working at all. 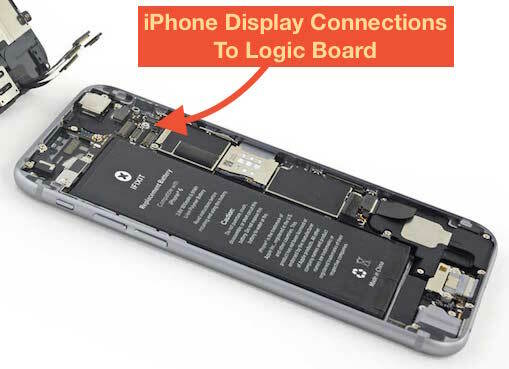 Liquid damage can interfere with the power supply of your iPhone or your iPhone battery’s internal connection to the logic board. The Lightning port on the bottom of your iPhone is also very susceptible to water damage. Without access to power, your iPhone won’t charge, and it won’t turn on. Fortunately, newer iPhones are water-resistant, so this problem happens a lot less than it used to. If you’re sure you charged your iPhone, but it still has no power, try doing a hard reset. Your iPhone’s software may have crashed, making the display appear completely black. Water damage can also make vertical lines appear on the display of your iPhone. Vertical lines on an iPhone screen usually indicates that its screen has become a little loose and the LCD cable has become disconnected from the logic board. Water that has seeped into your iPhone may have loosen the display, damaged the LCD cable, or damaged the logic board. Don’t be surprised if your iPhone’s flashlight appears “stuck” after getting exposed to water. A simple way to try and fix this problem is to perform a hard reset, which will force your iPhone to turn off and back on. 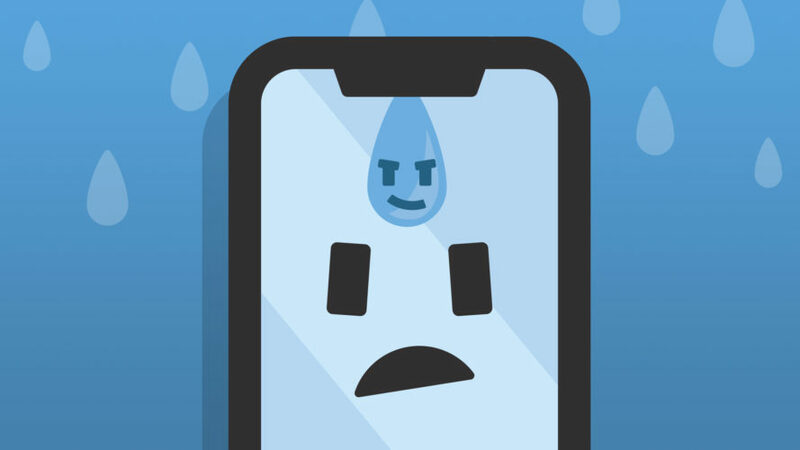 Oftentimes, this will successfully get the flashlight component of your iPhone “unstuck”, assuming that there isn’t any significant water damage. If everything else is working, or if you don’t want to blind your friends, a piece of black electrical tape can be an effective temporary “fix”. Your iPhone may falsely read that headphones are plugged into the headphone jack or Lightning port if water has entered either of these openings. 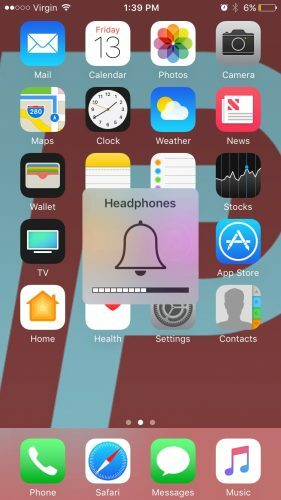 When this happens, your iPhone may get stuck in headphones mode. The presence of liquid could be tricking your iPhone to thinking that headphones are plugged in even if they aren’t. Another common problem people had when they came into the Apple Store was that their iPhone screen would be black, but everything else worked normally. They could even still hear noise coming from the speakers! When this happens, it usually means that the LCD cable got shorted out, making the screen completely black. You can try hard resetting your iPhone, but if the LCD cable is fried, it won’t fix the problem. Water-resistant iPhones are still very susceptible to liquid damage — there’s just a protective barrier that’s supposed to keep water out. That barrier and its ability to resist liquids can degrade over time, making the iPhone less protected from liquid contact. It’s also important to know that water-resistant iPhones aren’t designed to resist other liquids such as soaps and lotions. This is the main reason why we don’t recommend bringing your iPhone with you into the bathroom when you take a shower or bath. Below, we’ll talk about several different types of liquid damage and some scenarios that can result in iPhone water damage. Believe it or not, your iPhone can get water damage from steam, which we hear has some relation to water. (A joke.) 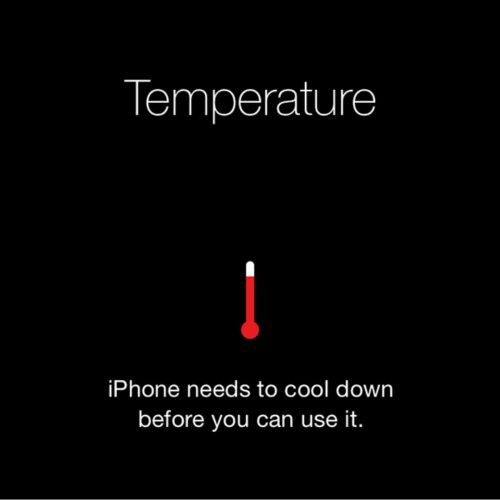 Apple recommends not using your iPhone in places like a sauna or any environment with extremely humid conditions. Steam can creep its way into openings of your iPhone and condensate once it gets inside. When the steam condenses, water can spread all throughout the inside of your iPhone. 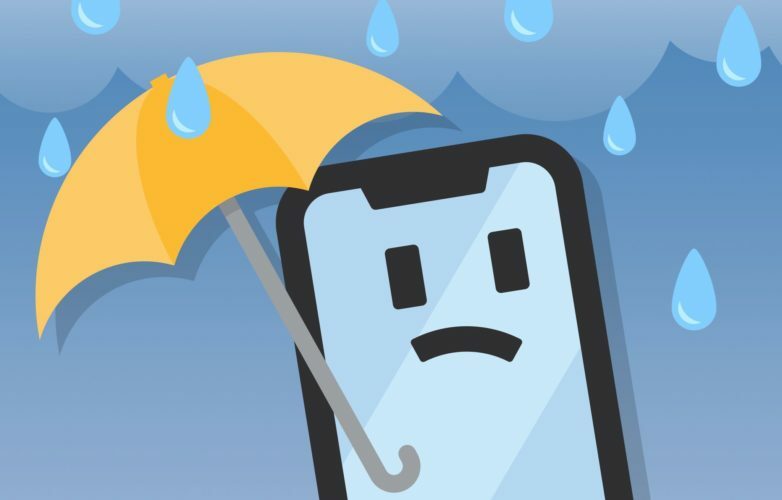 Can Rain Cause iPhone Water Damage? Yes, rain, another form of water, can cause iPhone water damage. Although every iPhone since the iPhone 7 is water- and splash-resistant, even the slightest amount of liquid can cause water damage. Unless your iPhone is in perfect condition, we recommend that you avoid using your iPhone in rainy weather. Rainwater can enter the ports and cause a lot of damage. You also need to be careful about using wired headphones on a rainy day, especially if you have an older iPhone. Water can run down the wires of your headphones into the headphone jack or Lightning port of your iPhone and cause damage once inside. Your iPhone is at risk of water damage if you use wired headphones at the gym. If you use wired headphones, sweat can run down the wire and enter the headphone jack or charging port. To avoid this problem completely, pick up a pair of Bluetooth headphones. No wires, no problem! Can Salt Water Damage Your iPhone? Newer iPhones are water-resistant, but they’re not saltwater-resistant. Salt water poses and additional threat that regular water doesn’t — corrosion. Salt water can corrode the internal components of your device, which adds another obstacle on top of potential water damage. It’s incredibly difficult to clean or fix corroded parts of an iPhone. You may have to get the corroded components replaced, or replace your entire phone. How Quickly Can Water Damage Occur? You’d be surprised by how much water can get inside of an iPhone, even after just a moment of submersion. Customers at the Genius Bar frequently had no idea why their iPhone suddenly stopped working — or so they said. Imagine their shock when I showed them the pool of water inside their iPhone after I opened it up! But I Thought My iPhone Was Waterproof! Advertising phones as water-resistant is a wonderfully effective tactic, because it makes people believe that they’re actually waterproof. But they’re not. The water-resistance of iPhones are rated by Ingress Progression, which is called an IP rating. This rating tells customers exactly how water and dust-resistant their phone is, with different specifications for each rating. iPhones before the 6s are not rated. The iPhone 7, 8, X, and XR are IP67. This means that these phones are dust-resistant and water-resistant when submerged up to 1 meter in water or less. The iPhone XS and XS Max are IP68 which means they are designed to be waterproof when submerged no deeper than 2 meters (6 feet) in water for 30 minutes or less. Apple also states that the iPhone XS, iPhone XS Max, and iPhone XR are can withstand spills from common household drinks like beer, coffee, juice, soda, and tea. Once again, Apple doesn’t cover liquid damage for iPhones, so we do not recommend intentionally testing these standards on your own! When your iPhone comes into contact with water or another liquid, acting quickly and correctly can be the difference between a broken phone and one that works. Above all, don’t panic. It doesn’t matter how fast you act, however, if you don’t know what to do. Some of the most popular water damage “fixes” actually do more harm than good. If you think your iPhone is water damaged, set it down on a flat surface and follow the steps below. Before we begin, we’d like to caution you against one thing: Don’t tilt or shake your iPhone, because that can cause the water inside your iPhone to spill onto other components and cause more damage. If your iPhone is in a case, remove it while holding your iPhone horizontally, with the screen pointing at the floor. Imagine there’s a pool of liquid inside (because there very well may be) and you don’t want that pool to migrate in any direction. Next, use a microfiber or other soft, absorbent cloth to wipe away any water on the outside of your iPhone. Don’t use a tissue, cotton swab, or anything else that can break apart or leave dust or residue inside your iPhone. One of the first things you’ll want to do when your iPhone has been exposed to water is to remove its SIM card. This serves the dual purpose of helping to save the SIM card itself and allowing air to enter your iPhone. Unlike the old days, an iPhone’s SIM card doesn’t contain your contacts or personal information. 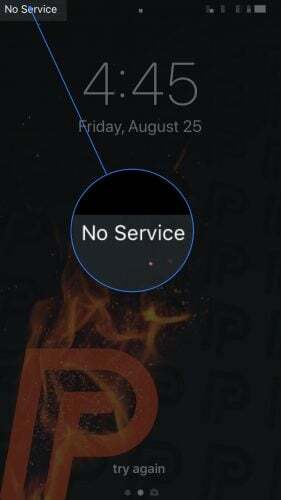 It’s only purpose is to connect your iPhone to the cellular network. Fortunately, SIM cards usually survive spills, unless they’re exposed to liquid for an extended period of time. If you have a fan, you can try blowing cool air directly into the lightning port or SIM card slot to increase airflow. Leave plenty of space between the fan and your iPhone. A gentle breeze is more than enough to help the evaporation process. Don’t use a blow dryer or any other kind of fan that blows hot air. Next, lay your iPhone face down on a flat surface, like a kitchen counter or a table. Choose a location with low humidity. Don’t place your iPhone in a container or a bag. Tilting your iPhone or placing it in a bag with rice will almost certainly cause the water to spill onto other internal components. That could be the difference between life and death for your iPhone. If you have access to commercial desiccants, set them on top of and around your iPhone. Whatever you do, don’t use rice! (More about that later.) It’s not an effective desiccant. Desiccants are substances that produce a state of dryness in other objects. They can be found in tiny little packets that are shipped with items such as vitamins, electronics, and clothes. Next time you get a package, save them! They’ll come in handy when you’re dealing with a liquid damage emergency. Once you’ve taken the initial steps to triage your iPhone, putting it down and walking away for is often the best thing you can do. If there is water inside your iPhone, the water’s surface tension will help to prevent it from spreading. Moving your iPhone can only cause more problems. As we’ll mention later, scientific studies have shown that exposing water-damaged electronics to open air can be more effective than sticking it in rice. By taking out the SIM card, we’ve allowed more air to get inside your iPhone, and that helps the evaporation process. We recommend waiting 24 hours before trying to turn your iPhone back on. Apple says to wait at least five hours. The more time, the better. We want to give any water inside your iPhone enough time to begin to evaporate. While your iPhone is still on a flat surface, plug it into power and wait for it to turn on. You can try using the power button, but you might not need to. If you’ve waited the 24 hours we’ve suggested, chances are it will have run out of battery. When that happens, your iPhone should turn on automatically after a few minutes of charging. If your iPhone turns on, back it up right away using iCloud or iTunes. Water damage can sometimes spread, and you may only have a small window of opportunity to save your photos and other personal data. I Dropped My iPhone In The Toilet! Dropping your iPhone in a toilet adds another factor to the situation: bacteria. In addition to following the steps above, we suggest wearing latex gloves while you handle your iPhone. Remember to disinfect your hands afterwards too! “I wiped it off!” she said unapologetically. If you bring your iPhone into an Apple Store or local repair shop after dropping it in the toilet, please be sure to tell the technician that it’s a “toilet phone” before you hand it to them. I’d suggest putting it in a ziplock bag for transport. I Dropped My iPhone In The Sink! If you dropped your iPhone in the sink, soap and food scraps can cause additional problems for your iPhone. Even if your iPhone is water-resistant, it isn’t soap-resistant. Apple recommends rinsing your iPhone off with tap water if it’s exposed to any other liquid. Your iPhone also isn’t food-resistant. Any scraps of food in your sink could potentially get lodged into the ports of your iPhone. If you see any scraps of food inside your iPhone’s ports, scrape them out using an anti-static brush or brand new toothbrush. I Dropped My iPhone In The Bathtub! Just like dropping your iPhone in the sink, dropping it in the bathtub can bring in problems with soaps, shampoos, and other shower products. Rinse off any areas of your iPhone that were exposed to shower products using tap water. If your iPhone is water damaged, lay your iPhone with the display facing down on a flat surface in a dry location. Remove the SIM card. Hold it horizontally, and don’t tilt or shake it. If you have commercial desiccants, place them on top of your iPhone. Don’t use rice, because scientific studies have shown that air is just as good, if not better. Wait 24 hours and let the water evaporate on its own before you try to turn it back on. There are a lot of at-home quick fixes and “miracle cures” others may recommend. However, we strongly recommend not listening to myths about miracles cures. A lot of the time, those “cures” can do more harm than good to your iPhone. In some cases, the at-home fixes can cause irreversible damage to your iPhone. The first myth we want to debunk is the most common “fix” for water-damaged iPhones: “If your iPhone gets wet, stick it in a bag of rice.” There’s a lot of conjecture about this issue, so we looked for a scientific basis for saying that rice doesn’t work. We found one scientific study called “The effectiveness of commercial desiccants and uncooked rice in removing moisture from hearing aids” that sheds light on the subject. Obviously, a hearing aid is different than an iPhone, but the question it addresses is the same: What’s the best way to remove liquid from small, water-damaged electronics? The study found that there’s no advantage to putting hearing aids in white or brown rice instead of just laying it down on an empty table and letting it air dry. However, there are definite disadvantages to using rice to attempt to dry out your iPhone. Rice can sometimes ruin an iPhone that otherwise could have been salvaged. A piece of rice can easily get wedged in a headphone jack or a charging port. The Lightning port is just about the size of a single grain of rice. Once one gets stuck inside, it can be very difficult, and sometimes impossible to remove. And so we want to be clear: Do not put your iPhone in a bag of rice. White rice; brown rice; it doesn’t matter. Plus, when you put your iPhone in bag of rice, you’ve wasted perfectly good rice! The second myth we’d like to address is whether or not it’s a good idea to put your water-damaged iPhone in the freezer. We believe people try putting their iPhone in the freezer to prevent the water from spreading all over the place. However, as soon as you take your iPhone out of the freezer, the water will just melt and spread throughout your iPhone anyway. When dealing with iPhone water damage, we want to get the water out as soon as possible. Putting your iPhone in the freezer does the opposite of this. It freezes the water inside your iPhone, trapping it and preventing it from escaping. Water is one of the only liquids that expands as approaches freezing. This means that freezing your iPhone will increase the volume of the water trapped inside, and possibly bring it into contact with previously undamaged components. There’s yet another reason why you probably shouldn’t put your iPhone in the freezer. iPhones have a standard operating temperature between 32–95° F. Their non-operating temperature only goes as low as -4° F, so it would be unsafe to put on in an environment colder than that. The standard freezer operates at 0° F, but they can sometimes be made colder. If you put your iPhone in a freezer at -5° F or colder, you run the risk of causing additional damage to your iPhone. Myth 3: Blow Dry Your iPhone, Or Stick It In The Oven! It Drys Your Hair, Shouldn’t It Dry Your iPhone? Do not attempt to blow dry the water out of your iPhone. Using a blow dryer could actually make the problem worse! A blow dryer will push water deeper into your iPhone. This would expose more of your iPhone to water, which is the opposite of what we want to happen. If you’re thinking of placing your iPhone in an oven to try to evaporate the water with heat, we wouldn’t recommend that either. According to Apple’s specifications, the iPhone XS has an operating temperature of up to 95° F (35° C) and a non-operating temperature of up to 113° F (45° C). If you have an oven that heats up to 110° F, then give it a try! I checked, and unfortunately, the lowest temperature on mine is 170° F.
Although some of the water-sensitive electronics inside your iPhone could theoretically withstand much higher temperatures, the screen, battery, waterproof seal, and other components are not as heat-resistant. Isopropyl alcohol is a less-commonly used home solution for fixing iPhone water damage. There are three big concerns when putting your iPhone in isopropyl alcohol. First, alcohol can wear down the oleophobic coating on your iPhone’s display. The oleophobic coating is what makes your the display fingerprint-resistant. You run the risk of really degrading the quality of the display by putting your iPhone in alcohol. Second, isopropyl alcohol is always diluted with some amount of another liquid. Usually, it’s water. By exposing your iPhone to isopropyl alcohol, you’re also exposing it to even more liquid. Third, isopropyl alcohol is a polar solvent. This means it’s extremely conductive. One of the biggest problems with water damage is that it creates electric charges in places where it’s not supposed to. You’d have to disconnect everything from your iPhone’s battery before you could even begin to consider using isopropyl alcohol. Disassembling an iPhone is a challenging task, requires a specialized toolkit, and can completely void your warranty. For these reasons, we strongly advise against try to fix your water-damaged iPhone using isopropyl alcohol. If you’ve taken the steps above and you’re still having issues, it’s time to make a decision about how to proceed. There are a lot of options, from buying a new phone to repairing a single component. Our goal is to provide you with the information you need to make the best decision for you and your water-damaged iPhone. Sometimes it can, and sometimes it can’t. Water damage is unpredictable. You’ll increase your chances of rescuing your iPhone by following our the steps we recommend above, but there are no guarantees. Remember that the effects of water damage aren’t always immediate. As liquid migrates inside an iPhone, components that had been working may suddenly stop. It could be days or weeks until problems start to occur. First Consideration: Do You Have AppleCare+ Or Insurance? If you have AppleCare+ or insurance through your wireless carrier, start there. AT&T, Sprint, Verizon, T-Mobile, and other carriers all offer some form of insurance. You’ll have to pay a deductible, but it usually costs a lot less than the price of a new iPhone. However, If you have an older phone and you’re looking for a reason to upgrade, then this may be the perfect time. The deductible for some carriers is actually a lot more out-of-pocket than financing a new iPhone with a monthly payment. AppleCare+ covers up to two “incidents” of liquid or other accidental damage, with a $99 service fee. If you don’t have AppleCare+, an out-of-warranty repair for water damage can be very expensive. Apple doesn’t repair individual components on water-damaged iPhones — they replace the entire phone. Although this may seem like a rip-off, their reason for doing so makes sense. Even though an individual part can sometimes be repaired, water damage is tricky and can often cause problems down the road as the water spreads throughout your iPhone. From Apple’s perspective, it wouldn’t be possible to offer a warranty on an iPhone that could break without warning. You’ll still pay less to replace an iPhone through AppleCare+ if you pay the deductible. That said, and especially given the out-of-warranty price of a repair through Apple, third-party services or repair shops that repair individual parts may be your best bet. Just know that replacing any component on your iPhone with a non-Apple part will completely void your warranty. AT&T, Sprint, T-Mobile, and Verizon use a company called Asurion to provide phone insurance to customers. Asurion Phone Insurance Plans cover liquid damage. After filing a claim, Asurion typically replaces the damaged device within 24 hours, as long as it’s covered under warranty. When you compare the cost of a new phone to the cost of replacing a single part, sometimes replacing the single part is the way to go. But sometimes it isn’t. If the rest of your iPhone is in good shape and your phone is relatively new, then a repair may be your best bet, especially if the water-damaged part is a speaker or another relatively inexpensive part. Replacing the entire iPhone may be the right move if more than one component is broken or it won’t turn on at all. It’ll be less of a headache and may be cheaper than replacing multiple broken parts. Whenever you buy a new phone, you have a big opportunity to save money. Up until recently, a lot of people stayed with their current carrier by default, because comparing prices across carriers was tedious and time-consuming. We created UpPhone to solve that problem. Our website has a search engine that makes it easy to compare every cell phone and every cell phone plan in the United States, side-by-side. Even if you’re happy with your current carrier, it might be worth taking a quick look at the newest plans they offer. Prices have dropped as competition has increased, and carriers don’t always let their current customers know when they could be saving money. On-demand, “we come to you” third-party repair companies are a great option if you just dropped your iPhone in water. Many of these repair services can send someone to you in less than an hour. Puls is one of our favorite on-demand repair services. They can send a certified technician directly to your door in as little as sixty minutes, and offer a lifetime warranty on all services. Your local “mom and pop” iPhone repair shop is another way to get immediate help if you drop your iPhone in water. Odds are that it won’t be as busy as an Apple Store, and usually you don’t have to make an appointment. However, we do recommend giving them a call before you go into the store. Not every repair shop repairs water-damaged iPhones, and sometimes local shops don’t have individual parts in stock. If your local repair shop recommends repairing multiple parts of your iPhone, you may want to consider purchasing a new phone. You may want to avoid mail-in services if you think your iPhone has water damage. Shipping your iPhone can shake it around and increase the risk of water spreading throughout your iPhone. However, if your iPhone is dry and it isn’t coming back to life, mail-in repair services often have turnaround times of just a few days and can cost less than other options. Can I Fix A Water-Damaged iPhone Myself? We don’t recommend trying to repair a water-damaged iPhone on your own, especially if you’ve never done it before. It can difficult to know what parts of your iPhone actually need to be replaced. It can be even harder to find high-quality replacement parts. Disassembling your iPhone requires a special set of tools. 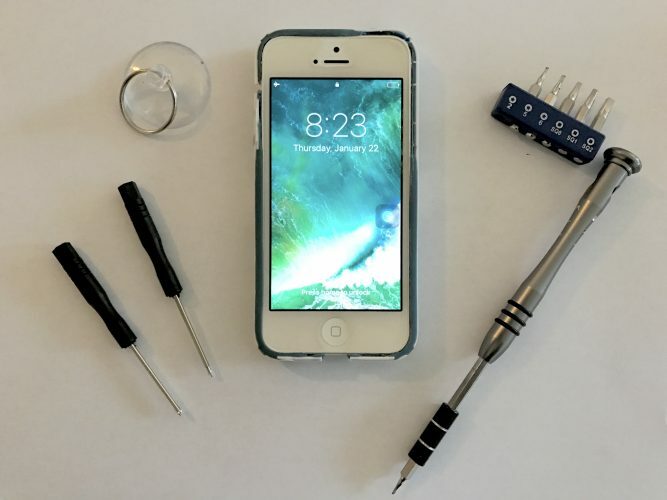 If you’re the adventurous type, you can buy an iPhone repair kit on Amazon for less than $10. Can I Sell A Water-Damaged iPhone? Some companies will purchase water-damaged iPhones from you in order to recycle them safely or salvage the parts that are still working. You probably won’t get much, but it’s better than nothing, and that money can be put towards purchasing a new phone. Check out our article for a comparison of the places where you can sell your iPhone. As we said before, sometimes the best option is to upgrade to a new iPhone, especially if your current phone would cost a lot to repair. Every iPhone since the iPhone 7, and many newer Androids, like the Google Pixel 3 and Samsung Galaxy S9, are water-resistant. The choice, however, is entirely up to you. Start by investigating your insurance coverage, and then move onto pricing out repairs. We know you’ll make the right decision. iPhone water damage problems are frustrating and difficult to solve, and we really hope this article helped you to fix your broken iPhone. We’d be grateful if you’d share this article with your friends, so they know what to do when they drop their phone in the toilet. We’d love to hear about your experience with iPhone liquid damage in the comments section below. Have you tried any other at-home liquid damage fixes? If you decided to get a new phone, which one did you pick? If you have any questions, feel free to ask them there, and we’ll to our best to get back to you. The post My iPhone Won’t Restore. Here’s The Real Fix! appeared first on Payette Forward. You’re trying to restore your iPhone, but it’s not working. You’ve plugged your iPhone into iTunes and started the restore process, but you’re seeing an error message like “This iPhone cannot be restored” and you don’t know what to do. In this article, I’ll explain why your iPhone won’t restore and exactly how to fix the problem with iTunes. Don’t panic: this is an extremely common issue. Restoring an iPhone erases everything on it, and it’s the go-to fix for iPhone software problems — especially serious ones. So let’s get to it! Apple’s own support page about what to do when your iPhone won’t restore is very limited, and frankly, it’s incomplete. They suggest a couple solutions, and they’re valid, but there are numerous reasons why an iPhone won’t restore with iTunes. In fact, this issue can be traced to both software and hardware problems — but it’s easy to solve if you approach it in the right way. Because of this, I’ve come up with a list of several solutions for fixing an iPhone that won’t restore. These steps address both software and hardware problems in a logical order, so you’ll be able to restore your iPhone again in no time. Look towards at the left-hand side of Apple toolbar at the top of your screen and click iTunes button. Click Check For Updates from the drop-down menu. 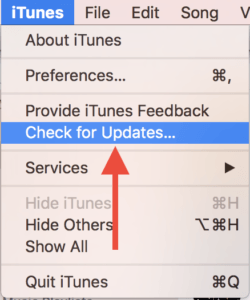 iTunes will then either update itself or notify you that your copy of iTunes is already up-to-date. From the Windows menubar, click the Help button. Click Check For Updates from the drop-down menu. iTunes for Windows will then either update itself or notify you that your copy of iTunes is already up-to-date. If your iTunes is already up-to-date, the next step in fixing your iPhone is to reboot your computer. On a Mac, just click the Apple button at the upper-left-hand corner of the screen and click Restart from the bottom of the drop-down menu. On a PC, click on the Start Menu and click Restart. We don’t always recommend hard resetting your iPhone, but it may be a necessary step when your iPhone won’t restore. 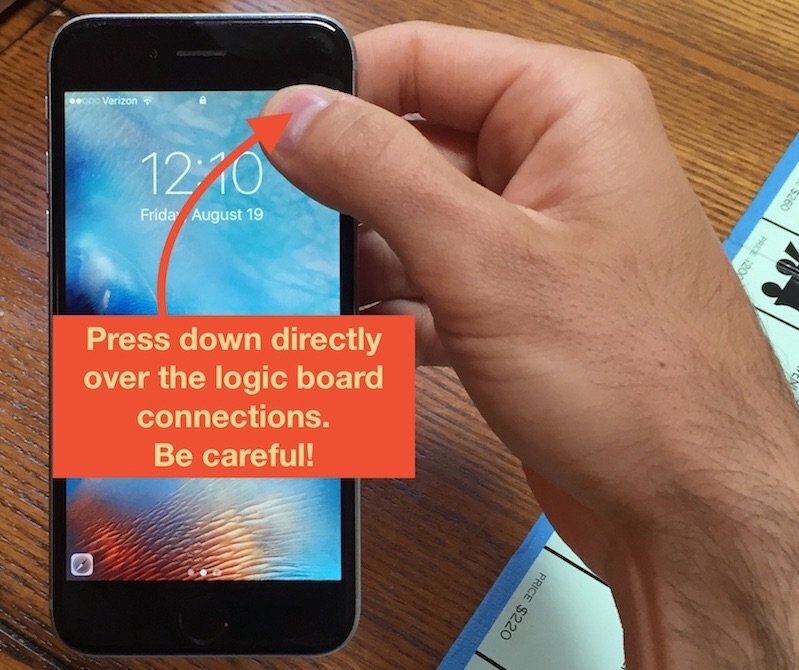 Make sure your iPhone is plugged into your computer while performing the hard reset. iPhone 6s, SE, and older: Simultaneously press and hold the Home button and the power button until you see the Apple logo appear on the display. iPhone 7 and iPhone 7 Plus: Simultaneously press and hold the power button and the volume down button. Release both buttons when the Apple logo appears on the screen. iPhone 8 and newer: Quickly press and release the volume up button, then quickly press and release the volume down button, then press and hold the side button. Release the side button when the Apple logo appears. Oftentimes, an iPhone won’t restore because a broken or otherwise faulty Lightning cable. 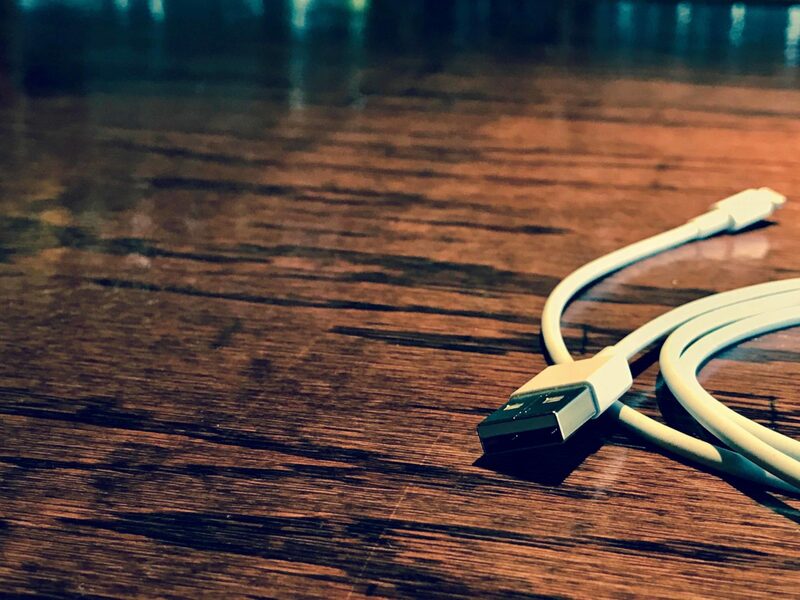 Try using a different Lightning cable, or borrow one from a friend. Additionally, using third-party cables that are not MFi-certified by Apple can cause restore problems. MFi-certified means that Apple has tested the cable to be compliant with its standards and that it is “made for iPhone.” If you’re using a third-party cable that’s not MFi-certified, I highly recommend purchasing a high-quality, MFi-certified lightning cable made by Amazon — it’s 6 feet long and less than half the price of Apple’s! Problems with the USB port on your computer can cause the restore process to fail, even if that same port works with other devices. An iPhone won’t restore if one of your USB ports is damaged or doesn’t supply enough power to charge your device throughout the entire restore process. With this in mind, always try using a different USB port to restore your iPhone before you move on to the next step. It’s time to try a DFU restore if, after trying a new USB port and Lightning cable, your iPhone still won’t restore. This is a special type of restore that clears your iPhone’s hardware and software settings, giving your iPhone a completely clean slate. Oftentimes a DFU restore will let you restore iPhones that are experiencing software difficulties that prevent normal restores. Follow our DFU restore guide here. If your iPhone is still not restoring, there’s a chance that your iPhone needs to be sent in for repair. Luckily, this doesn’t have to be an expensive or time consuming process. If you decide to go to an Apple Store for help, make sure to make an appointment at the Genius Bar first so you don’t end up waiting in a very long line. If you’re looking for a less-expensive alternative, Puls will send a certified technician to you to fix your iPhone in as few as 60 minutes, and they offer a lifetime warranty on their work. In this article, you learned how to fix an iPhone that won’t restore, and if you ever have the problem again, you’ll know exactly what to do. I hope this article helped you to fix your iPhone, and let us know if it did in the comments section below! The post There Are Lines On My iPhone Screen! Here’s The Fix. appeared first on Payette Forward. You’re seeing lines on your iPhone’s screen and you’re not sure why. This problem usually occurs when your iPhone’s LCD cable gets disconnected from its logic board, but it could also be a software problem. In this article, I’ll explain why there are lines on your iPhone screen and show you how to fix the problem for good! First, let’s try and rule out a minor software glitch. Restarting your iPhone will let all of its programs shut down normally, which could fix a problem causing lines to appear on your iPhone’s display. If you have an iPhone 8 or older model, press and hold the power button until slide to power off appears on the screen. 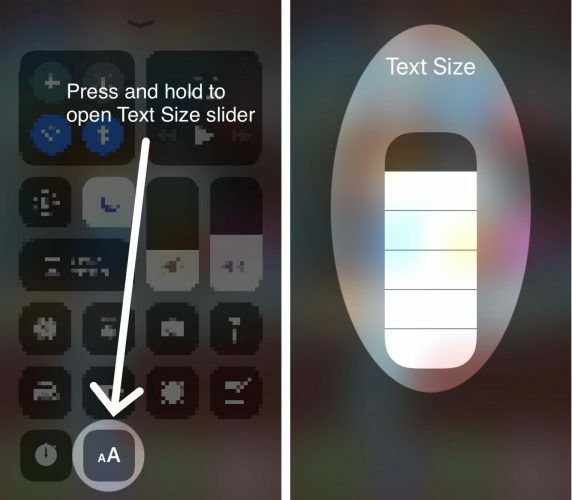 On an iPhone X or newer model, simultaneously press and hold either volume button and the side button until slide to power off appears. Swipe the white and red power icon from left to right to shut down your iPhone. Wait a few seconds, then press and hold the power button (iPhone 8 and earlier) or the side button (iPhone X and newer) until the Apple logo appears on the center of the display. In some cases, the lines on your iPhone screen will be so obstructive that you can’t see anything on the screen. If the lines on your iPhone screen are completely obstructing your view, you can restart it by doing a hard reset. A hard reset abruptly turns your iPhone off and back on. iPhone 6s and earlier models: Simultaneously press and hold down the Home button and the power button until you see the Apple logo flash onto the screen. iPhone 7 and iPhone 7 Plus: Press and hold the volume down button and the power button simultaneously until the Apple logos appears on the center of the screen. iPhone 8 and newer models: Quickly press and release the volume up button, then the volume down button, then press and hold the side button. When the Apple logo appears on the display, release the side button. It can takes 25–30 seconds before the Apple logo appears, so be patient and don’t give up! We recommend backing up your iPhone as soon as possible if there are still lines on the screen. This may be your last chance to back up if your iPhone is seriously damaged or suffering from liquid damage. Backing up your iPhone saves a copy of all the information on it. This includes your photos, contacts, videos, and more! You can use iTunes or iCloud to back up your iPhone. You’ll need a Lightning cable and a computer with iTunes to back up your iPhone to iTunes. If you want to backup your iPhone to iCloud, you don’t need a cable or a computer, but you will need enough iCloud storage space to save the backup. The Device Firmware Update (DFU) restore is the deepest type of iPhone restore and it’s the last step we can take to rule out a software problem. This type of restore erases and reloads all the code on your iPhone, restoring it to its factory defaults. We strongly recommend saving a backup of the information on your iPhone before putting it in DFU mode. Check out our step-by-step guide when you’re ready to put your iPhone in DFU mode! Most of the time, lines on your iPhone screen is the result of a hardware problem. It can occur when you drop your iPhone on a hard surface, or if your iPhone gets exposed to liquids. Vertical lines on the display of your iPhone is typically an indicator that the LCD cable is no longer connected to the logic board. Set up an appointment at your local Apple Store to meet with a technician, especially if your iPhone is covered by an AppleCare+ Protection Plan. We also recommend Puls, an on-demand repair company that can send a certified technician directly your home or office. They can be there to help you fix the vertical lines problem on your iPhone within sixty minutes! I hope this article helped you fix your iPhone or find a repair option that will help you get its screen replaced as soon as possible. Now that you know why there are lines on your iPhone screen, make sure to share this article on social media with family and friends! Leave any other questions you have for us in the comments section below. The post How Do I Change Font Size On An iPhone? The Easy Fix! appeared first on Payette Forward. You’re having a tough time reading text on your iPhone and you want to change the font size. 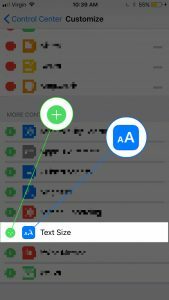 There are two ways to change text size on an iPhone — in the Settings app, or in Control Center if your iPhone is running iOS 11. 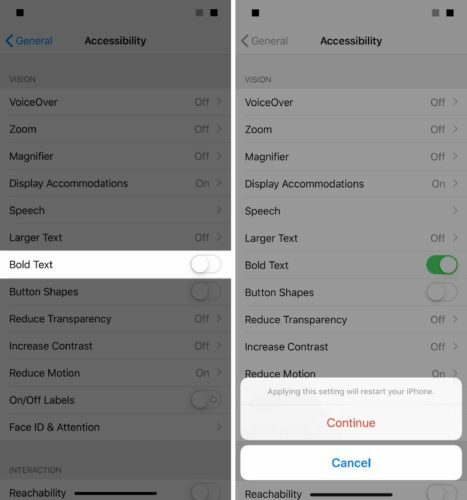 In this article, I’ll show you how to change font size on an iPhone in both the Settings app and Control Center so you can find the perfect text size for your iPhone! Drag the slider at the bottom to change font size on your iPhone. If you want even larger text size options, turn on the slider next to Larger Accessibility Sizes. 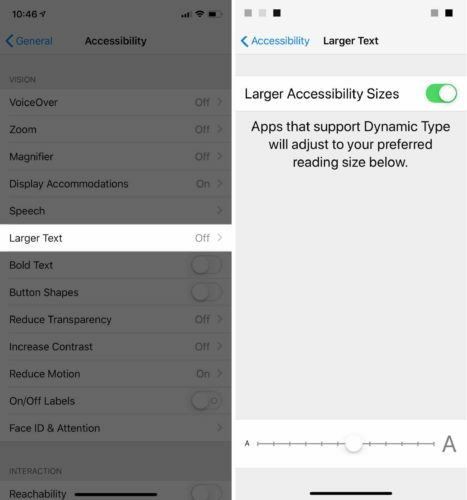 Note: Larger Accessibility font sizes will only work in apps that support Dynamic Type, a feature that lets app developers design apps that adjust to fonts of various sizes. Apple integrated the ability to customize your iPhone’s Control Center with the release of iOS 11. One of the features you can add to Control Center is Text Size, which allows you to quickly and easily change the font size on your iPhone. If you’re not sure whether or not your iPhone is running iOS 11, open up the Settings app and tap General -> About. Look on the right side of Version to find which version of iOS you have installed (ignore the number in parenthesis on the right). If the number is 11 or greater, you can customize the iPhone Control Center! Tap Customize Controls to open the customization menu. Scroll down and tap the green plus button located to the left of Text Size to add it to Control Center. To open Control Center, use your finger to swipe up from below the bottom of your iPhone’s display. Press and hold the Text Size control until the vertical Text Size slider appears on your iPhone’s display. To change font size on your iPhone, drag the slider up or down. The higher you drag the slider, the larger the text on your iPhone will become. In addition to increasing the size of the font on your iPhone, you can make text bold! Bold text is thicker than standard text, so you may have an easier time reading it. Open Settings and tap General -> Accessibility. Turn on the switch next to Bold Text. When you do, you’ll see a pop-up saying that you’ll have to restart your iPhone before you can turn Bold Text on. Tap Continue to restart your iPhone. All the text on your iPhone will be bold as soon as it turns back on. This Font Is Too Small. This Font Is Too Large. This Font Is Just Right! You’ve successfully changed the font size on your iPhone and you’re having a much easier time reading text on it. We encourage you to share to tip on social media so your friends and family can find the perfect text size for their iPhones. Thanks for reading, and feel free to leave us a question or comment down below! The post My iPhone Says “This Accessory May Not Be Supported.” Here’s The Fix! appeared first on Payette Forward. You plugged in your iPhone to charge it, but something’s not working right. It stopped charging and an interesting pop-up appear on the screen — your iPhone says “This accessory may not be supported.” In this article, I’ll explain why you’re seeing this message on your iPhone and show you what you can do to fix the problem. Why Does My iPhone Say “This Accessory May Not Be Supported”? Your iPhone’s software is malfunctioning. Your accessory is dirty, damaged, or completely broken. Your iPhone Lightning port is dirty, damaged, or completely broken. Your charger is dirty, damaged, or completely broken. 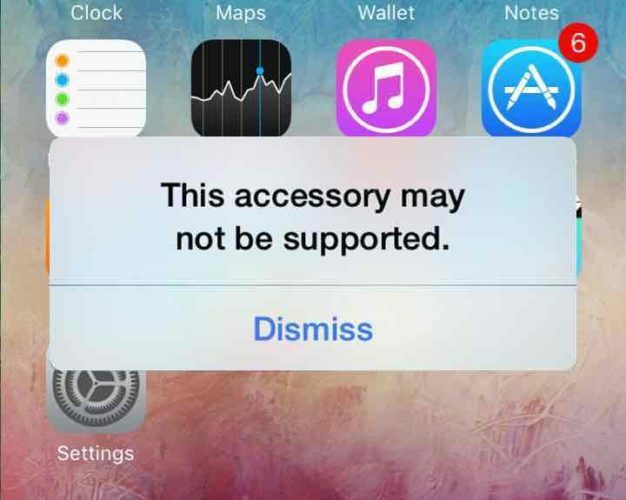 Most of the time, the “This accessory may not be supported.” pop-up appears shortly after you plug your iPhone into a power source to charge it. 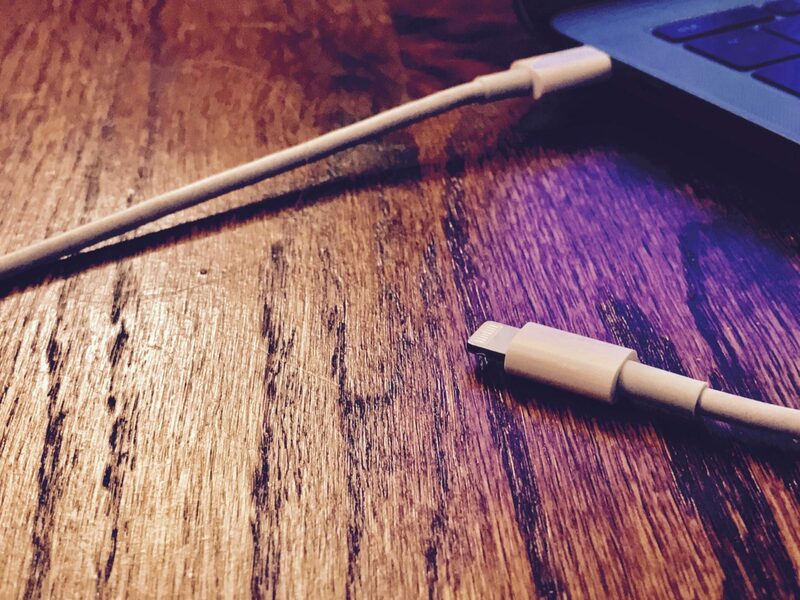 In most cases, the charging cable you’re trying to charge your iPhone with isn’t MFi-certified, meaning that it wasn’t made consistent with Apple’s design standards. The charging cables you can buy at your local gas station or dollar store are almost never MFi-certified because they are so cheaply made. In some cases, these cables can also cause significant damage to your iPhone by overheating it. If possible, charge your iPhone with the cable that it came with. If the charging cable your iPhone came with isn’t working, you can exchange it for a new one at your local Apple Store, so long as your iPhone is covered by an AppleCare plan. Your iPhone might be saying “This accessory may not be supported.” because of a minor software glitch. 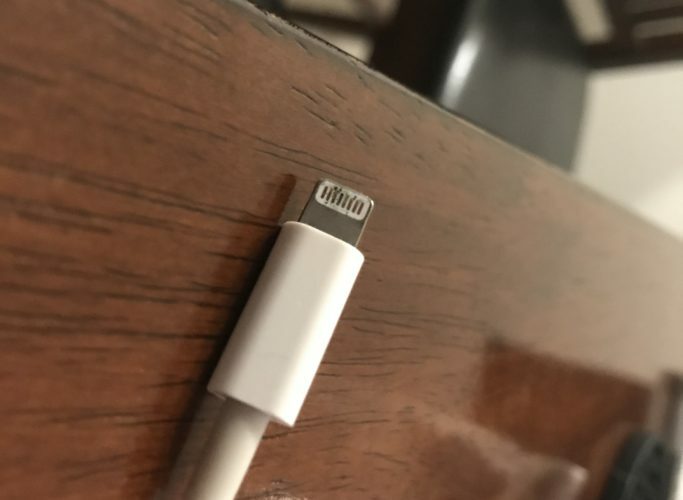 When you plug an accessory into the Lightning port of your iPhone, your iPhone’s software determines whether or not to connect to the accessory. Try restarting your iPhone, which can sometimes fix minor software problems. If you have an iPhone 8 or earlier, press and hold the power button, then swipe the power icon left-to-right across the display. The process is similar for the iPhone X, XS, and XR, except you press and hold the Side button and either volume button until slide to power off appears. Wait 15-30 seconds, then turn your iPhone back on by pressing and holding the power button (iPhone 8 and earlier) or the Side button (iPhone X and newer). Once your iPhone turns back on, try connecting to your accessory again. If it works, then a software glitch was causing the problem! If you’re still seeing the pop-up on your iPhone, move onto the next step. Now that you’ve eliminated the possibility of a charging cable that’s not MFi-certified and a minor software issue, it’s time to inspect accessory. Most of the time, the accessory you’re trying to use when you see the “This accessory may not be supported.” pop-up is a charging cable. However, any device or accessory that plugs into your iPhone’s Lightning port could cause the alert to appear. Take a close look at the Lightning connector end (the part of the accessory that plugs into your iPhone’s Lightning port) of the accessory you’re trying to use. Is there any discoloration or fraying? If so, your accessory may be having trouble connecting to your iPhone. This was the case recently for me, as some damage to my charging cable caused my iPhone to receive the “This accessory may not be supported.” pop-up, even though I got the cable from Apple. Exposure to water could also damage the Lightning connector of your accessory, so if you recently spilled a drink on your accessory, that could be why it’s not working. If your charging cable is the accessory that’s causing the problem, also take a close look at the USB end. Is there any dirt, lint, or other debris stuck in the USB end? If so, clean it out using an anti-static brush or unused toothbrush. If you don’t own an anti-static brush, you can find a great six-pack on Amazon. If the accessory is in decent shape, take a look inside the Lightning port on your iPhone. Any gunk, dirt, or debris could prevent your iPhone from making a clean connection to your accessory. Grab a flashlight and take a close look inside your iPhone’s Lightning port. If you see anything that doesn’t belong inside the Lightning port, use an anti-static brush or unused toothbrush to clean it out. If your iPhone says “This accessory may not be supported.” when you try to charge it, there could also be an issue with your iPhone’s charger, not the Lightning cable. Take a close look inside the USB port on your iPhone’s charger. Like in the previous step, use an anti-static brush or brand new toothbrush to clean out any gunk, lint, or other debris. Make sure you also try charging your iPhone with multiple different chargers. If your iPhone only has charging issues with one charger, then it’s probable that your charger is causing the problem. If you keep seeing the “This accessory may not be supported.” pop-up regardless of what charger you use, then your charger isn’t the problem. Some accessories (especially those made by Apple) require a certain version of iOS to be installed on your iPhone before they can connect. 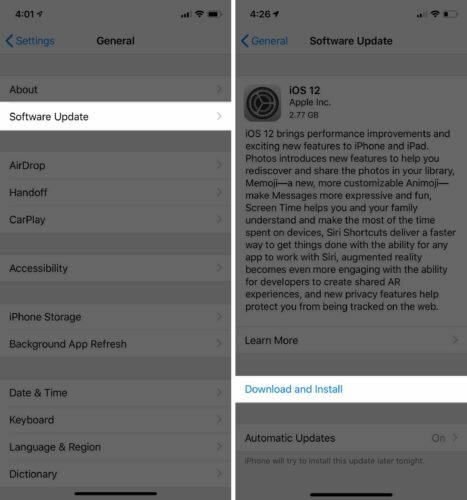 Go to Settings -> General -> Software Update and tap Download and Install if a software update is available. Check out our article if you have trouble updating your iPhone. Before you can install the update, make sure your iPhone is charging or has at least 50% battery life. When the installation begins, your iPhone will turn off and a status bar will appear on the display. When the bar is full, the update is complete and your iPhone will turn back on shortly after. Although unlikely, there’s a small chance a deeper software problem is causing your iPhone to say “This accessory may not be supported.” By performing a DFU restore, we can eliminate this deep software problem by completely erasing it from your iPhone. When you perform a DFU restore, all of the code on your iPhone gets deleted and reloaded back onto your iPhone. For a complete walkthrough, check out our guide on performing a DFU restore on your iPhone! If your iPhone still says “This accessory may not be supported.” after you’ve followed all of the steps above, you may need to get your accessory replaced or iPhone repaired. As I mentioned earlier in this article, you can get the charging cable and wall charger that came with your iPhone replaced if your iPhone is covered by AppleCare. It’s also possible that your iPhone Lightning port is broken or damaged and has to be repaired. If your iPhone is covered by AppleCare, schedule an appointment at the Apple Store near you and have a tech take a look at it. We also recommend an on-demand repair service called Puls, which sends a certified technician to you who will repair your iPhone on the spot. Your accessory is working and your iPhone is functioning normally again! Next time your iPhone says “This accessory may not be supported.”, you’ll know exactly how to fix the problem. If you have any other questions, feel free to leave them in the comments section below. The post My iPhone Touch Screen Is Not Working! Here’s The Fix. appeared first on Payette Forward. It’s natural to feel frustrated when your iPhone touch screen is not working. 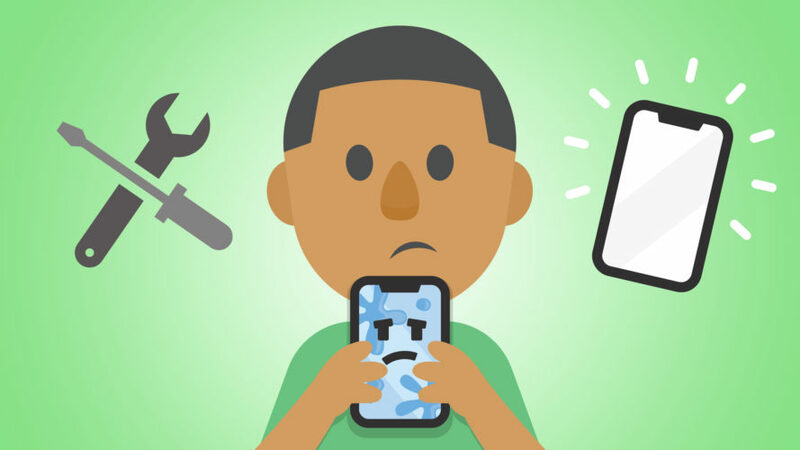 You use your iPhone for everything, from making calls to scrolling through pictures — but don’t let your “touch screen troubles” get you down. In this article, I’ll explains why the touch screen on your iPhone is not working, how to fix the problems that can be fixed at home, and recommend some great repair options, if it comes to that. There are a lot of reasons why your iPhone touch screen might stop working. Thankfully, there are also a lot of ways to fix those problems. Why Is My iPhone Touch Screen Not Responding? The first thing we need to do is figure out why your iPhone touch screen. Usually, the problem is caused when the physical part of your iPhone’s display that processes touch (called the digitizer) stops working correctly or when your iPhone’s software stops “talking” to the hardware the way it should. In other words, it could be a hardware or a software problem, and I’ll help you with both in this article. Troubleshooting iPhone software problems typically doesn’t cost anything. It’s also easier than prying off your screen with suction cups (please don’t do this). For this reason, we’ll start with the software fixes and move on to fixing the physical problems if you have to. A note about drops and spills: If you’ve recently dropped your iPhone, odds are a hardware problem is to blame for your touch screen trouble — but not always. Slow apps and problems that come and go are usually caused by software problems. A problem with the software that tells your phone how to act can cause your iPhone touch screen to stop working. It may help to reset troublesome software if your iPhone touch screen is not working. Find the app on your iPhone’s Home screen. The Home screen is what you see below in the screenshot below. Lightly press and hold your finger on the app icon until all the icons start to shake and there is an “X” in the upper-left corner of the icon. Tap the “X” and then Delete to remove the app from your iPhone. If your iPhone touch screen is not working after you’ve reinstalled the app, send a message to the app developer. They may have a fix for the problem or be working on a solution already. How Do I Send a Message to the App Developer? Tap to open the App Store. Tap Search at the bottom of the screen and search for the app. Tap the app icon to open details about the app. Scroll to the bottom and tap Developer Website. The developer’s website will load. Look for a contact form or email address on the developer’s website. It shouldn’t be hard to find it the developer is worth their salt. Remember that good developers appreciate it when you let them know about problems with their apps! If your iPhone won’t turn off in the normal way — or if turning your iPhone off and back on again doesn’t solve the problem — try doing a hard reset. To do this, hold the Power and Home Buttons down at the same time. Wait several seconds, until the Apple logo appears on the screen, and then let go. On an iPhone 7 or 7 Plus, a hard reset is performed by pressing and holding the power button and volume down button together for several seconds until the you see the Apple logo appear on the display. To hard reset an iPhone 8 or newer model, press and release the volume up button, press and release the volume down button, then press and hold the side button until the screen goes black and the Apple logo appears on the center of the display. A hard reset abruptly stops all of the background processes on your iPhone and can cause software issues. It usually doesn’t, but it’s a good idea to only do a hard reset when you need to. My iPhone Touch Screen Still Isn’t Working! Is your iPhone touch screen still giving you problems? It might be time to try restoring your iPhone to its original settings. Before you do this, be sure to backup your iPhone. You can do this by plugging your iPhone into a computer and running iTunes or using iCloud. I recommend performing a DFU (Default Firmware Update) restore. This type of restore is a bit more thorough than a traditional iPhone restore. To do this, you’ll need your iPhone, a cable to plug it into the computer, and the most recent version of iTunes. Putting your iPhone into DFU mode can be a little tricky. For a simple step-by-step walkthrough, check out our article that explains exactly how to put your iPhone into DFU mode. When you’re done, come back here. If you’ve dropped your iPhone recently, you may have damaged the screen. A cracked display is one of the most obvious signs of a damaged screen and can cause all sorts of issues with the touch screen. A drop can also loosen or damage the delicate under-layers of your iPhone touch screen. What you see and put your hands on is just one part of the touch screen. Underneath, there’s an LCD screen that creates the images you see. There’s also something called a digitizer. The digitizer is the part of the iPhone that senses your touch. The LCD screen and digitizer both connect to your iPhone’s logic board — that’s the computer that makes your iPhone work. Dropping your iPhone can loosen the cords that connect the LCD screen and digitizer to the logic board. That loose connection can make your iPhone touch screen stop working. When iPhones get dropped, the tiny cables that connect to your iPhone’s logic board can become dislodged just enough for the touch screen to stop working, even if there’s no physical damage. It’s a longshot, but you may be able to fix your iPhone’s touch screen by pressing down on the part of the display where the cables connect to the logic board. Warning: Be careful! If you press down too hard, you could crack the display — but this may be one of those “nothing left to lose” situations, and it has worked for me before. If your iPhone touch is not working because it’s completely broken, you could order a kit and try to swap out the parts yourself, but I wouldn’t recommend it. If something goes wrong and you’ve replaced any part of your iPhone with a non-Apple part, the Genius Bar won’t even look at your iPhone — you’ll be on the hook for a brand new iPhone at full retail price. The Genius Bar does a great job with broken displays, but they charge a premium for their service. If you’d like to save some money, I recommend high-quality third-party repair services like Puls if you’d like to save some money. Puls will come to you and fix your iPhone in as little as 30 minutes with a lifetime warranty, all for less money than Apple. Once the damaged pieces are replaced, your iPhone touch screen should work like new. If it doesn’t, the software is probably to blame. Your iPhone touch screen is a complex and fascinating piece of technology. I hope this article has helped you if you iPhone touch screen is not working, and I’d love to know which solution worked for you in the comments section below. Thanks for reading! If you're missing incoming calls or asking yourself, "Why does my iPhone not ring? ", don't worry: The fix is simple and I'll walk you through it. The post My iPhone Won’t Ring! Here’s The Real Reason Why. appeared first on Payette Forward. Picture this: You’re waiting for an important phone call. You’ve double-checked your iPhone to make sure the ringer is on and you’ve turned the volume all the way up. When the phone rings, you’re going to hear it. 5 minutes go by and you glance at your iPhone, only to find out you’ve missed the important call! Don’t throw your phone at the cat. In this article, I’ll explain why your iPhone won’t ring and I’ll show you exactly how to fix it. Update: If you have an iPhone 7, this article will work for you — but you may want to check out my new article called My iPhone 7 Won’t Ring for an iPhone 7-specific walkthrough. Otherwise, keep reading! Martha Aron inspired me to write this article when she asked, “My iPhone does not ring on all calls, I miss lots of calls and texts because of this. Can you help me?” Martha, I’m here to help you and everyone else that has missed incoming calls and texts because their iPhone isn’t ringing. If you’re reading this article, you probably already know that for your iPhone to ring, the Ring / Silent switch on the side of your iPhone has to be set to ring. If the switch is pulled toward the screen, your iPhone’s ringer is turned on. If the switch is pushed toward the back of the iPhone, your iPhone is on silent and you’ll see a small orange stripe next to the switch. You’ll also see the speaker icon on the iPhone display when you flip the switch. Once you’re sure the Ring / Silent switch is set to ring, make sure your iPhone ringer is turned up so you can hear your iPhone ring when you get a call. You can turn up the ringer volume by pressing the volume up button on the side of your iPhone. You can also turn up the ringer volume by opening Settings -> Sounds & Haptics. 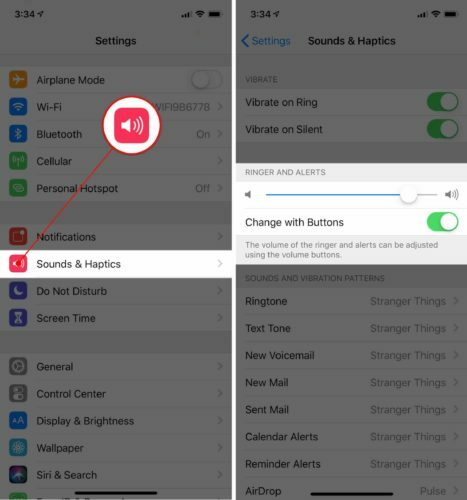 Drag the slider under Ringer And Alerts to the right to turn up the ringer volume on your iPhone. The further you drag the slider to right, the louder the ringer will be. Here’s The Fix: Turn Off Do Not Disturb! Most of the time, the reason an iPhone won’t ring for incoming calls is that the user has accidentally turned on the Do Not Disturb feature in Settings. 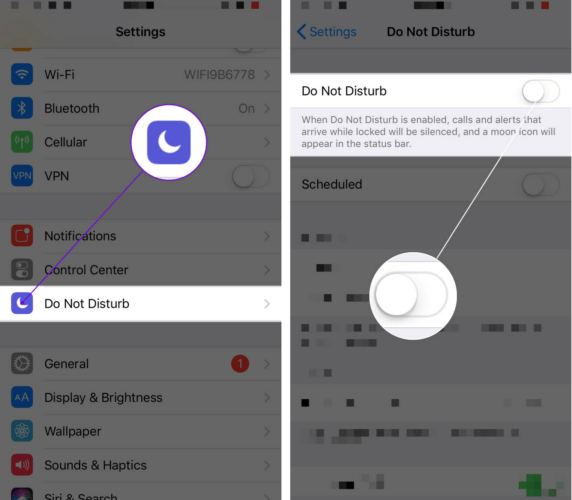 Do Not Disturb silences calls, alerts, and notifications on your iPhone. 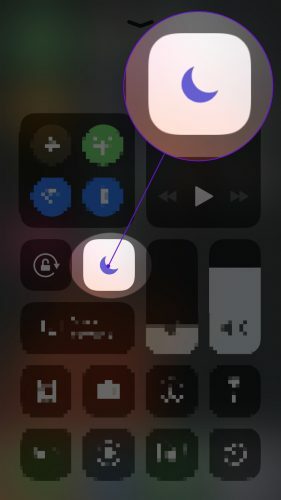 The easiest way to tell if Do Not Disturb is turned on is to look in the upper right hand corner of your iPhone, just to the left of the battery icon. If Do Not Disturb is enabled, you’ll see a small moon icon there. If you’d like to dive deeper into Do Not Disturb and set up an automatic schedule, instance, head to Settings -> Do Not Disturb to see all the options available to you. Ever since Apple released iOS 7, it’s been easy to turn Do Not Disturb on and off. Swipe up from the bottom of the display to open Control Center. 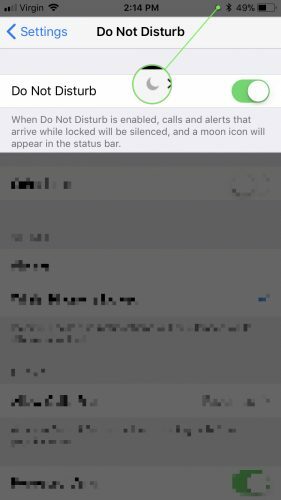 Tap the moon icon to turn Do Not Disturb on or off. That’s it! If you have an iPhone X or newer, open Control Center by swiping down from the upper right-hand corner of the screen. You can also turn off Do Not Disturb by going to Settings -> Do Not Disturb and turning off the switch next to Do Not Disturb. You’ll know Do Not Disturb is off when the switch is white. What If My iPhone Still Won’t Ring? I’ve received a couple of comments from readers who have taken all of the suggestions and whose iPhones still aren’t ringing. If you’ve made it this far and your iPhone won’t ring, there’s a good chance you may have a hardware problem. Often times, when gunk or liquid gets into one of the ports (like the headphone jack or lightning / dock connector), your iPhone thinks there’s something plugged into it, when in fact there isn’t. 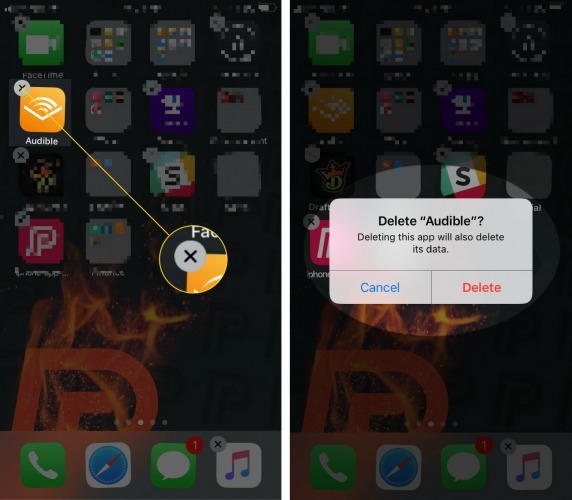 My article about how to fix an iPhone that’s stuck in headphone mode explains why that happens and how to fix the problem. 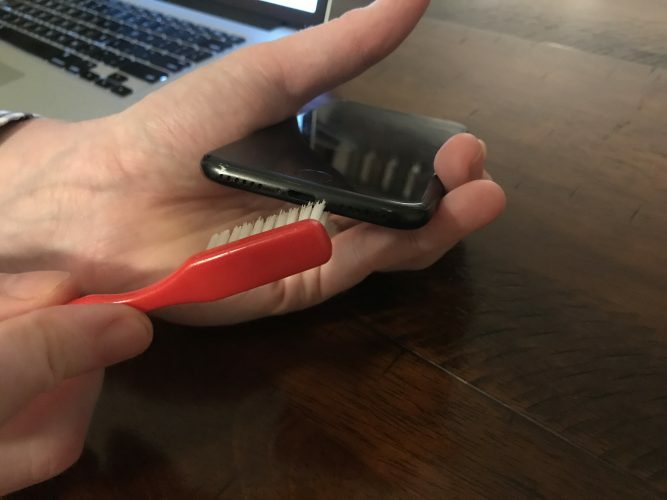 It’s a long shot, but you can take an antistatic brush (or toothbrush you’ve never used before) and try to brush out the gunk from your headphone jack or lightning / dock connector port. Antistatic brushes are helpful for cleaning all sorts of electronics, and you can pick up a 3-pack on Amazon for less than $5. If you’re successful, the issue should resolve itself. Unfortunately, most of the time the damage has already been done. Something has shorted out on the inside of your iPhone, so the only solution is to visit your local Apple Store or use the mail-in options at Apple’s support website to have your iPhone repaired. Apple Store repairs can be expensive. If you’re looking for a less-expensive option, I recommend Puls, a repair company that will send a certified technician to you who can meet you and fix your iPhone within an hour. Do Not Disturb is one of those great features that comes in handy if you know how to use it, but it can be really frustrating if you don’t. To Martha and everyone else who has missed important calls or yelled “My iPhone won’t ring!” at an innocent bystander, I hope this article has you to solve your silent iPhone problem. If you have follow-up questions or other experiences to share, post them in the comments section below. I look forward to hearing from you! The post How To Put An iPhone In DFU Mode, The Apple Way appeared first on Payette Forward. DFU stands for Device Firmware Update, and it’s the deepest type of restore you can do on an iPhone. An Apple lead genius taught me how to put iPhones into DFU mode, and as an Apple tech, I’ve done it hundreds of times. Surprisingly, I’ve never seen another article explain how to enter DFU mode the way I was trained. A lot of the information out there is just plain wrong. In this article, I’ll explain what DFU mode is, how firmware works on your iPhone, and show you step-by-step how to DFU restore your iPhone. If you’d rather watch than read (actually, both can be helpful), skip down to our new YouTube video about DFU mode and how to DFU restore an iPhone. The Home Button is the circular button below your iPhone’s display. The Sleep / Wake Button is Apple’s name for the power button. You’ll need a timer to count to 8 seconds (or you can do it in your head). If you can, back up your iPhone to iCloud or iTunes. Plug your iPhone into your computer and open iTunes. It doesn’t matter if your iPhone is on or off. Press and hold the Sleep / Wake Button and Home Button (iPhone 6s and below) or the volume down button (iPhone 7) together for 8 seconds. Let go of the Home Button or volume down button. Your iPhone’s display will be completely black if you’ve successfully entered DFU mode. If it’s not, try again from the beginning. A lot of other websites give false, misleading, or overcomplicated steps when telling you how to DFU restore your iPhone 8, 8 Plus, or X. They’ll tell you to turn off your iPhone first, which is completely unnecessary. Your iPhone does not have to be off before you put it in DFU Mode. If you like our videos, watch our new YouTube video about how to DFU restore your iPhone X, 8, or 8 Plus. If you prefer to read the steps, the process is actually a lot easier than they make it out to be! The process starts off just like a hard reset. To DFU restore your iPhone X, 8, or 8 Plus, quickly press and release the volume up button, then quickly press and release the volume down button, and then press and hold the side button until the screen goes black. As soon as the screen turns black, press and hold the volume down button while continuing to hold the side button. After 5 seconds, release the side button but continue to hold the volume down button until your iPhone shows up in iTunes. As soon as it appears in iTunes, release the volume button. Ta-da! Your iPhone is in DFU mode. Note: If the Apple logo is appearing on the screen, you held down the volume down button for too long. Start the process over from the beginning and try again. The steps for putting an iPhone XS, XS Max, XR in DFU mode are exactly the same as the steps for the iPhone 8, 8 Plus, and X. Check out our YouTube video about putting an iPhone XS, XS Max, or XR in DFU mode if you’re more of a visual learner! We use my iPhone XS to walk you through every step of the process. Check out our new YouTube tutorial on how to put an iPhone into DFU mode and how to perform a DFU restore if you’d like to see it in action. When you DFU restore your iPhone, your computer erases and reloads every bit of code that controls the software and hardware on your iPhone. There’s the potential for something to go wrong. If your iPhone is damaged in any way, and especially if it’s water-damaged, a DFU restore may break your iPhone. I’ve worked with customers who tried to restore their iPhones to fix a minor problem, but water had damaged another component that prevented the restore from completing. A useable iPhone with minor problems can become completely unusable if a DFU restore fails because of water-damage. What’s Firmware? What Does It Do? Firmware is the programming that controls the hardware of your device. Software changes all the time (you install apps and download new email), hardware never changes (hopefully, you don’t open your iPhone and rearrange its components), and firmware almost never changes — unless it has to. What Other Electronic Devices Have Firmware? All of them! Think about it: Your washing machine, dryer, TV remote, and microwave all use firmware to control buttons, timers, and other basic functions. You can’t change what the Popcorn setting does on your microwave, so it’s not software — it’s firmware. DFU Restores: All Day, Every Day. Apple employees restore a lot of iPhones. Given the option, I’d always choose a DFU restore over a regular or recovery mode restore. This isn’t official Apple policy and some techs would say it’s overkill, but if an iPhone has a problem that can be resolved with a restore, a DFU restore stands the best chance of fixing it. The post iPhone Cellular Update Failed? Here’s Why & The Fix! appeared first on Payette Forward. You can’t make or receive calls or use cellular data on your iPhone. You received a notification about a cellular update, but you’re not sure what it means. In this article, I’ll explain why an iPhone cellular update failed and show you how to fix the problem good! Do You Have An iPhone 7? A small number of iPhone 7 models have a hardware defect that makes the Cellular Update Failed notification appear. It also makes your iPhone display No Service in the upper-left hand corner of the screen, even if cellular service is available. Apple is aware of this problem, and they’re offering a free device repair if your iPhone 7 qualifies. Check out Apple’s website to see if your iPhone 7 qualifies for a free repair. 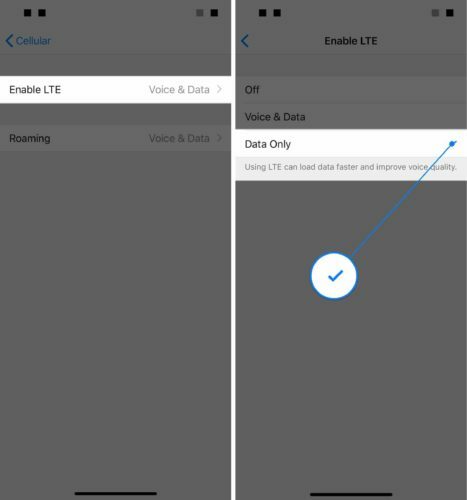 Some people have reported that turning off Wi-Fi calling and Voice LTE fixed the problem on their iPhone. This definitely isn’t a perfect solution, and you’ll want to go back and turn Wi-Fi Calling and Voice LTE back on after updating your iPhone to a more recent version of iOS. It’s also important to point out that not every wireless carrier supports Wi-Fi calling or Voice LTE. If you don’t see these options on your iPhone, move onto the next step. Open Settings and tap Cellular -> Wi-Fi Calling. 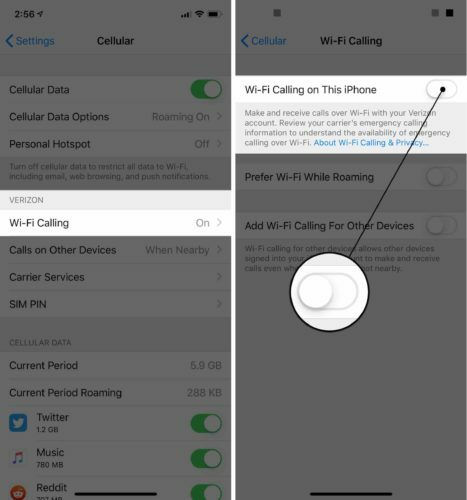 Turn off the switch next to Wi-Fi Calling on This iPhone to turn off Wi-Fi Calling. Next, go back to Settings -> Cellular and tap Cellular Data Options. Tap Enable LTE -> Data Only to turn off Voice LTE. You’ll know Voice LTE is off when the blue checkmark appears next to Data Only. 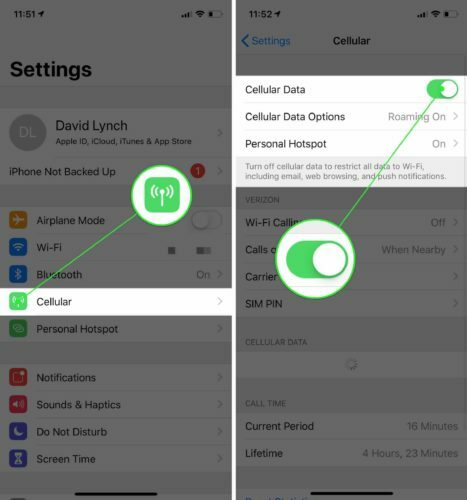 Your iPhone won’t connect to cellular networks if Airplane Mode is turned on. Sometimes toggling Airplane Mode on and off again can fix minor cellular connectivity issues. 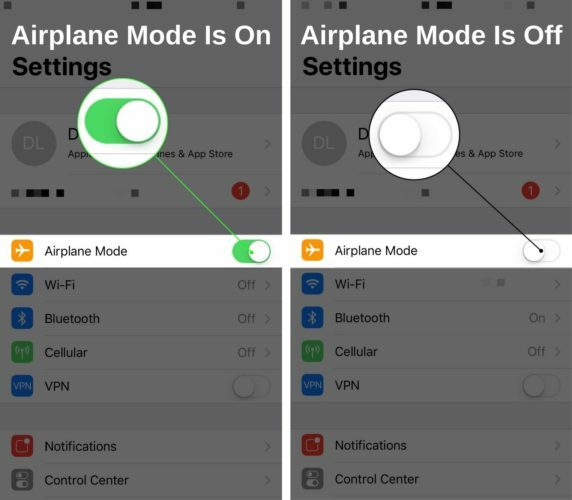 Open Settings and tap the switch next to Airplane Mode to turn it on. Tap the switch again to turn it off. You’ll know Airplane Mode is off when when the switch is white. Another quick way to fix minor cellular connectivity issues is to turn Cellular Data off and back on. This doesn’t always work, but it doesn’t hurt to try. Open Settings and tap Cellular. Then, tap the switch next to Cellular Data at the top of the screen to turn it off. Tap the switch again to turn Cellular Data back on. 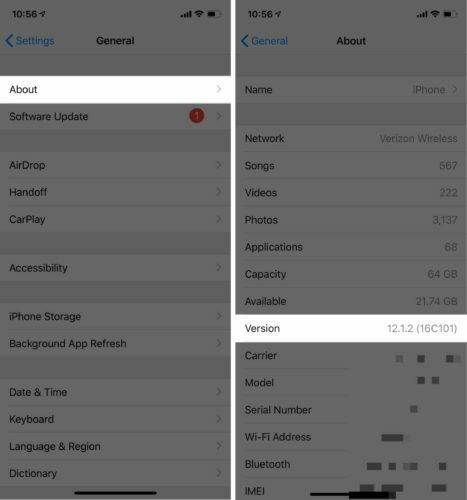 A carrier settings update is an update released by your cell phone carrier or Apple to improve your iPhone’s ability to connect to your carrier’s cellular network. 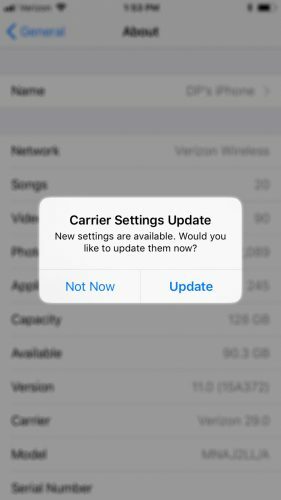 Carrier settings updates aren’t released as frequently as iOS updates, but it’s important to regularly check to see if one is available. Open Settings and tap About to check for a carrier settings update. If an update is available, a pop-up will appear within about ten seconds. Tap Update if a carrier settings update is available. If an update isn’t available, move onto the next step. Apple often releases iOS updates to introduce new features and fix bugs like the one you’re experiencing right now. Open Settings and tap General -> Software Update to see if an iOS update is available. Tap Download and Install if a software update is available. 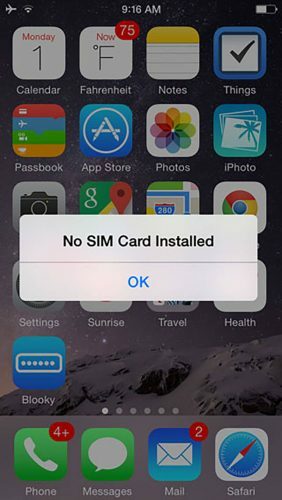 Since it’s not uncommon for your iPhone to say No SIM when you receive the Cellular Update Failed notification, it’s a good idea to eject your SIM card and put it back in. Grab your SIM card ejector tool or, since you probably don’t have one of those, straighten out a paper clip. 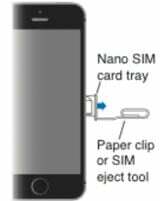 Stick the ejector tool or your paper clip into the hole in the SIM card tray to pop it open. Push the SIM card tray back into your iPhone to reseat the SIM card. 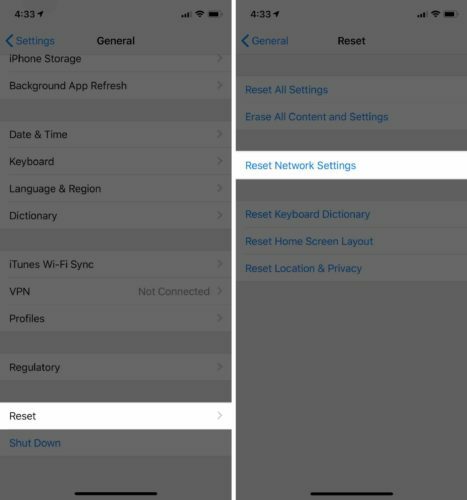 Resetting the network settings erases all of the Cellular, Wi-Fi, Bluetooth, VPN settings on your iPhone. By erasing all of the network settings at once, you can sometimes fix a troublesome software issue. Open Settings and tap General -> Reset -> Reset Network Settings. Tap Reset Network Settings to confirm your decision. The DFU restore is the deepest iPhone restore. Every single line of code is erased and reloaded, reseting your iPhone to factory defaults. Make sure you save a backup of your iPhone before putting it in DFU mode! Everything gets wiped from your iPhone during the DFU restore process. Saving a backup will make sure you don’t lose any any of your photos, videos, and other saved files. When you’re all set, check out our other article to learn how to put your iPhone in DFU mode and restore! You’ll want to contact Apple or your wireless carrier if your iPhone still says Cellular Update Failed after you put in DFU mode. There may be something wrong with your iPhone’s cellular modem. Set up an appointment at your local Apple Store to see if an Apple tech can help you fix the problem. However, don’t be surprised if Apple tells you to get in touch with your wireless carrier. There could be a complex issue with your account that can only be resolved by a customer service representative of your wireless carrier. Updated And Ready To Go! You’ve fixed the problem on your iPhone and you can start making calls again! 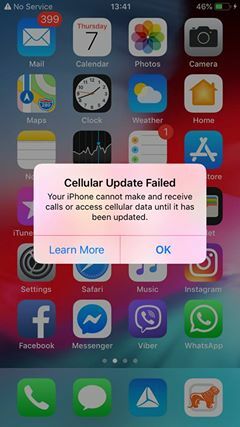 Make sure you share this article on social media to teach your family and friends what to do when their iPhone says Cellular Update Failed. Feel free to leave any other questions you have about your iPhone in the comments section below.